This past spring I was giving a talk about the My CancerIQ risk assessment tool at one of Ontario’s largest primary care conferences. And, as I so often do, I remarked that chronic disease prevention and screening are reasons why I choose to practise family medicine. They've always resonated with me. Many of us think of prevention as the traditional focus of family medicine. So much of our work involves discussing eating enough fruits and vegetables (potatoes don’t count), exercising, quitting smoking and maintaining a healthy weight. I often joke with my patients that I am just reiterating what we all learned in kindergarten about health. Further, when age or other risk factors dictate, we offer screening for several cancers. Most provinces and territories now have organized screening programs for colorectal, cervical and breast cancer. Certainly, we in primary care often evaluate patients with signs and symptoms suggestive of cancer. We also provide the psychosocial support one might need during the anxiety-provoking period just before diagnosis. However, many family physicians feel that when their patients suspect or are diagnosed with cancer, they are swallowed up into the black box of the cancer system. Contrary to the above black box belief, there is some evidence that visits to one’s own primary care provider increase during the treatment phase for some cancers. The family physician also has a role to play for their patients in survivorship and end-of-life care. However, I have to say I've been most struck by some of my colleagues who actually provide cancer treatment as family physicians. For one, I hear of the sophisticated treatments GPOs often administer to our patients. Many are newer biologics that have numerous side effects and complications. They also engage in training others and this has allowed patients in rural and remote areas to receive cancer care closer to home. Most recently I was in northern British Columbia and saw this first-hand. The health authority has a central cancer centre, where GPOs are integral to the care of the patients in this region. But most impressive was that there were nine satellite clinics that allow patients to stay in their communities and not have to travel hundreds of kilometers for care. These clinics are staffed by highly skilled nurses and GPOs. Patients reported great satisfaction with this care, especially when travelling for an in-person assessment is mired by winter weather. So I’ve had a bit of an awakening. The reality is that many family physicians don’t just prevent cancer or detect it earlier, they treat it. For many patients and communities, care wouldn’t be possible without them. Dr. Ed Kucharski is a Regional Primary Care Lead (Toronto Central LHIN, South) for Cancer Care Ontario and the Toronto Central Regional Cancer Program. 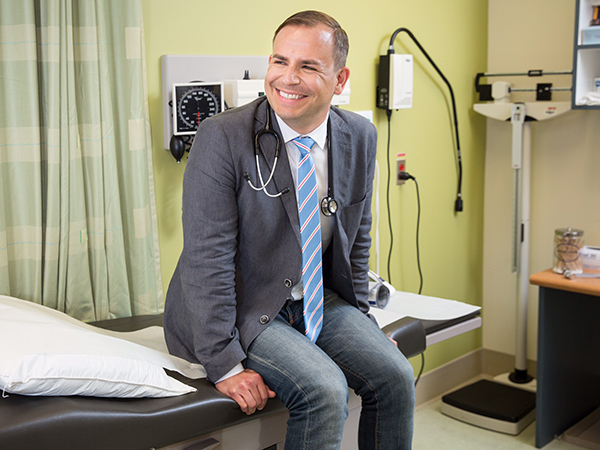 He is also a practising Family Physician at the South East Toronto Family Health Team and the Chair of the College of Family Physicians of Canada's Cancer Care Committee. This blog first appeared on the Canadian Family Physician blog space.